Here's a fast and easy way to keep barbed wire fence lines tight. The Wire Tight fence tightener consists of a 17-in. long, hinged metal tool with 2 handles, one slightly longer than the other. Both halves are fitted with rows of interlapping teeth. The operator spreads the 2 halves apart so the 2 sets of teeth form a "jaw" over the wire. He pushes the top half of the tool down through the bottom half to crimp the wire, then raises it back up to release the wire. 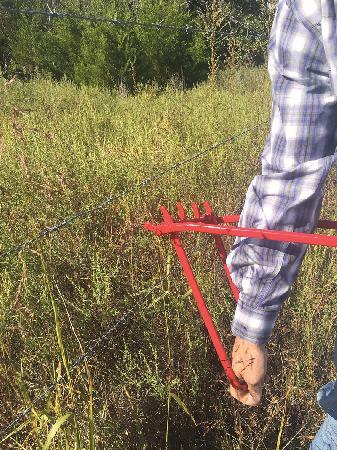 "The Wire Tight weighs only about 3 lbs., which makes it easy to use, It works fast " you can tighten a fence line in minutes," says Micki Rychecky. ?It takes up to 6 in. of slack with every "bite", which is why it works without breaking your old wire. You can crimp a piece of wire multiple times without breaking it." The Wire Tight sells for $39.95 plus S&H. Contact: FARM SHOW Followup, Micki Rychecky (ph 303 915-9092; Micki@cowcreekranchhouse.com; www.radiatorgenie.com).